The aesthetic value of a website is very important because when a user visits a site the first thing he will notice is how your site looks like. It can change the whole experience of the user. If the user has a good experience then there is a chance that he will visit again. As like as aesthetic value, there are also some points you need to know when you are setting up your blog. Points like the template you are using are SEO friendly and SEO optimized or not. If the theme you are using is not SEO friendly then search engine crawler will have some delay when analysing your page. This could affect your page ranking. I think there is another one factor to keep in mind when changing your template, checking is the theme you are going to use is mobile friendly or not. For some people, it’s not a great deal. But for me, a good amount of my total traffic comes from mobile devices. 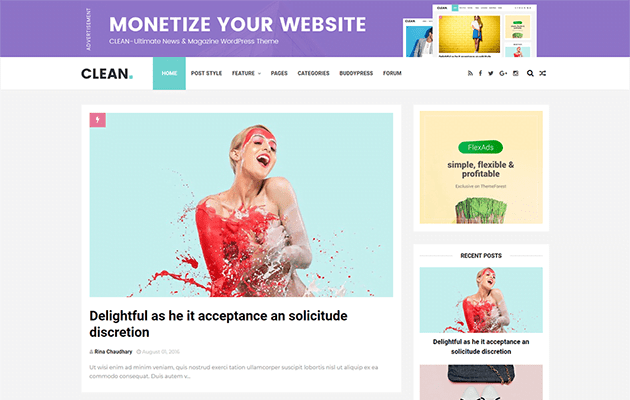 If you are a new blogger does not have money to buy an amazing template which suits you, then here are the 10 I think most impressive, professional, SEO optimized templates which you can choose. Those templates are free to use but you have to give credit to there developers at the bottom. I think it’s ok because they are doing a really hard job making those templates. Also, I have to note if you don’t want to full control of those then you can always buy it. Bright Mag is a beautiful and well-designed template. It has 3 ad section which supports responsive ads. This theme is created by BThemez and it’s adsence ready template, you just need to do some customization and you are ready to go. Clean is one of the fastest templates which load quickly among the other 10 templates. As the name suggests clean template has a clean professional looking design. It can be your choice if your niche is about magazine, news or personal blog. This theme is created by ThemeXpose. 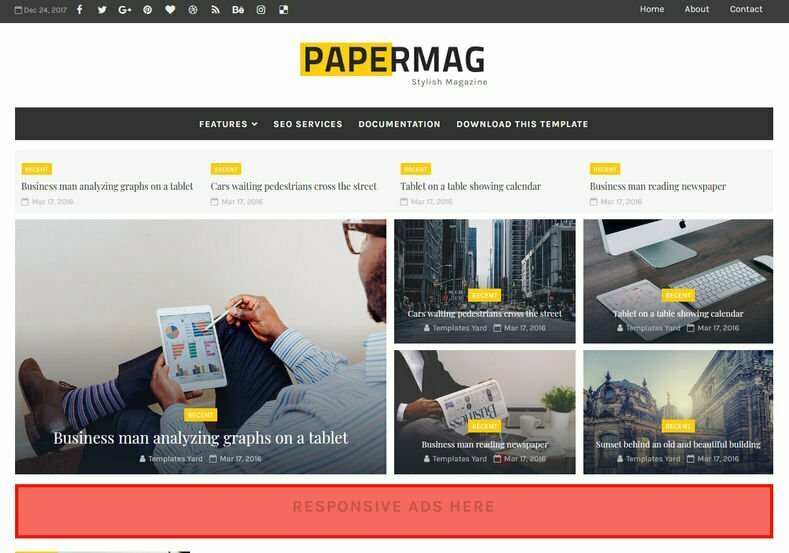 PaperMag is a new theme created by TemplatesYard, loaded with latest google fonts and fontawesome which makes it compatible with every new browsers version. It’s a stylish template based on colour combinations of white, black and yellow. This template is perfectly suited for blogs like a review, food, makeup, travel, tech, personal, photography etc. Sauna is another great theme created by BThemez. It will be a nice choice for you if you upload blogs related to photography or videos. It uses the same Masonry grid technology used by Pinterest. 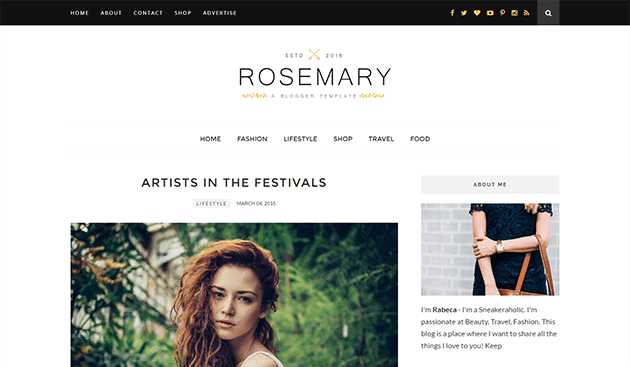 If you are searching for a Minimalist template than you should go for Rosemary template. It’s well crafted thinking about small things, to give your viewer an amazing experience. If you are a creative blogger or running a small magazine this can be your perfect template. They also included any widget you will need like Instagram or Pinterest widget. This template is designed my ThemeExpose. G Vusion 2 is a classic and beautiful template by getanytemplate. It’s fully mobile optimized and SEO ready template which comes with a number of social widgets. It’s beautifully designed template with Elegant Footer which divided into two columns. VIPI is a clean looking template which has a simple design. It has a very special feature called fast loading which enables it to load a simpler version when a user using a slower connection. VIPI is super responsive, it is optimized for different types of devices which have different screen size. 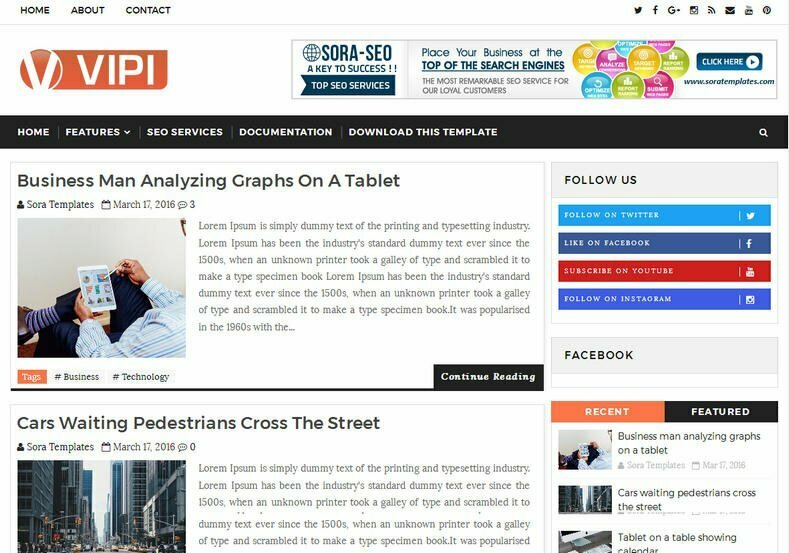 This responsive and SEO ready template is designed by SoraTemplates. 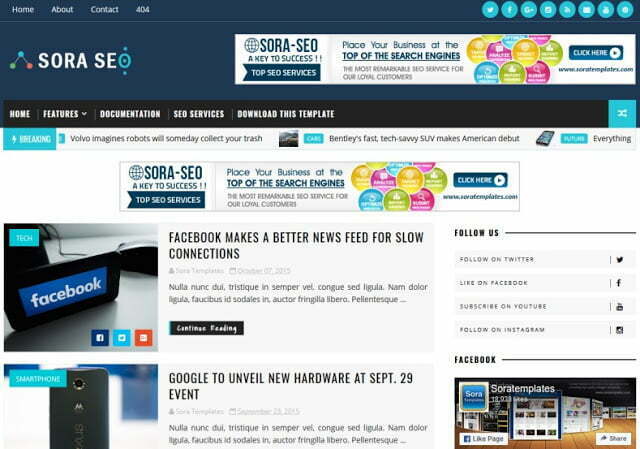 Sora Seo is a smart and clean template which can be best suited for different personal blogs. It is a highly SEO optimized theme with meta tags and auto title generator which will help to rank faster on search engines. It’s developed by SoraTemplates. 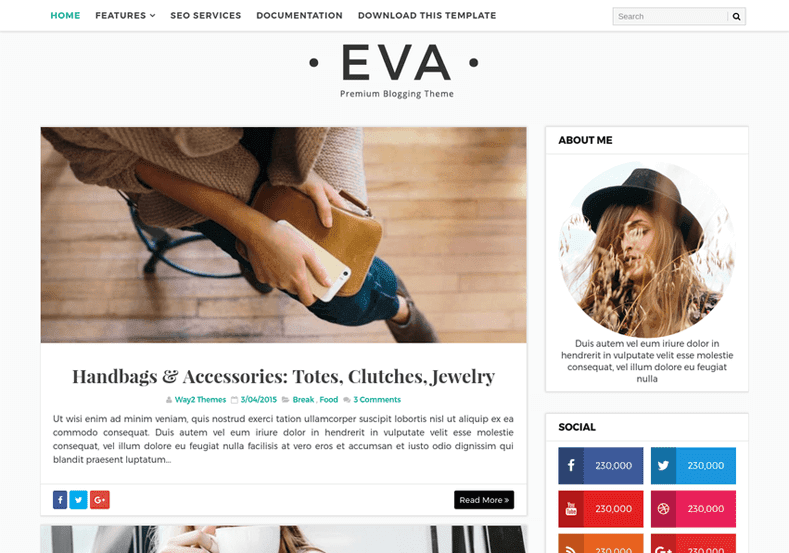 Eva is a responsive template which mainly designed for fashion bloggers but with some customization, it’s came be used for any types blogs. 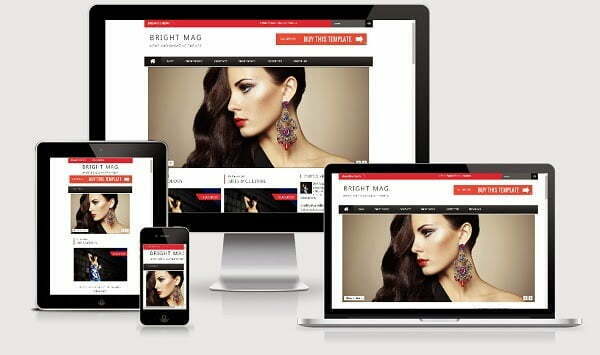 It’s a responsive design has the ability to adjust template screen size with viewing screen size. 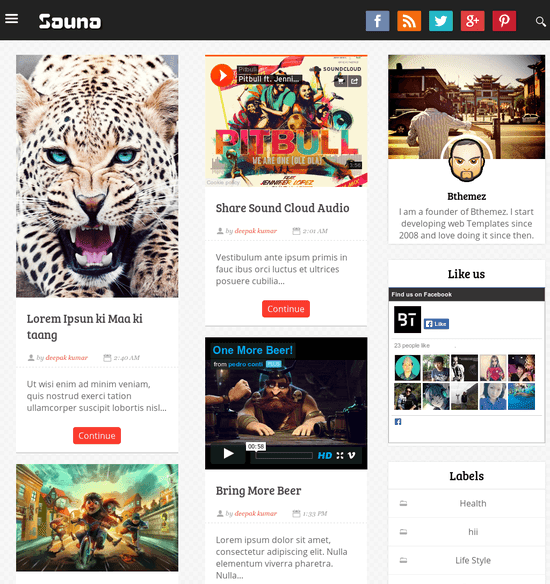 This theme is designed by Way2Themes. It has some included widget which will show latest social feed and display your social media profiles. 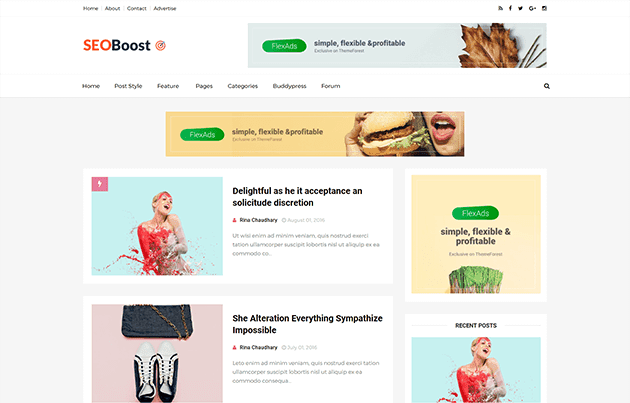 SeoBoost is another theme made by ThemeXpose. It’s fully optimized for latest SEO guidelines and standards. If you really wanna make your page superb fast and suited for any searching guidelines then SeoBoost can be your choice. It scores 100 out of 100 in Google Insight usability test. Those are 10 themes among them you can select anyone which will give your blog a new aesthetic value and a great performance. Those 10 themes are my personal choice If you have some other favourite let me know in comments. If you need any help regarding setup your new themplate let me know in comments, I will happy to help you. I would like to hear from you, tell me in comments below if you have any queries or feedback. Thank you. I like these templates! You made a really good point that blogger templates need to be mobil friendly, most of my readers are likely reading on their cell phones! These are nice templates, my favorite is CLEAN. I'd like to pay someone to build me a faster more SEO friendly theme this year, if things go well! Thank you for these! I might have to get a new template for the new year. These look awesome. All these templates look great. Having a responsive and clean looking website is vital. Love these, thank you! Happy 2018! Great resource. I have pinned for reference. I am always nervous to update my site. Great chance to try. I think that it is wonderful that the templates are free. For me I think that Rosemary is the most beautiful template, but I think they are all great options! These are all beautiful templates. The Rosemary template is my favorite! Clean is my favorite one of these themes. It is great they offer free ones to choose from. There are some good layouts on here! I like that you can test them out a bit for committing! Really nice templates. I will have to check them out later. Good point about templates needing to be mobile friendly. Most of my traffic comes from mobile devices. I like quite a few of these templates, it's always hard to decide on the perfect one. My favorite template was the bright mag version. Thanks for the compilation! I love all the themes but I think Paper Mag caught my heart! Happy New Year! I really like the Rosemary theme and the Paper Mag one as well. I love the simplicity of Blogger templates. My current template is pretty close to the paper template. I love a good magazine style layout. I'd say I like the rosemary and Eva template the most, They seem simple and not over crowded. Very easy to get around the site itself. I do like to see blog templates. There are so many great styles out there to work with and change things up! Great resources for blogger templates. I personally cant use a template because I have a designer but these look professional. Great list of blogger templates, these are really ideal! I would love to try EVA it's my style, just simple but elegant and of course Rosemary, just love it. These template are so cute!! I would definitely have to go with Rosemary (although I'm liking Eva too). It's simple yet elegant at the same time especially if people are looking to do fashion lifestyle blogs. Basically those themes are free, you can also pay for them if need to remove bottom credit. Hmm It's always great to test a template before pay for it . I'm glad that you found this page helpful ..! :) If you need any help regarding change drop a message at out contact us page. I'm Glad that you like those templates suggestions. Theses are all great templates and I like how they look simple and clean lines. Great resource! I always keep my eyes out for improved design and functionality. Appreciate you sharing! Clean and Bright Mag are definitely workable for me, definitely going to check them out. Didn't have redesign in mind, time wise, but have been open to it. Thanks for the ideas! Clean is my fave. I am going to share this with my hubby. He is launching a blog and looking to build his site out over the next month or so. Thanks for the blogger templates. I can consider some of these when I choose a new template for my site. thanks for the informative post. I like paper mag. Those templates are so cool and really perfect for bloggers. I loved to try EVA, I like the simplicity of this templates. Who doesn't like free?! Thanks for providing it for bloggers. very helpful. Lovely templates! Good to know they’re free too! Rosemary & Sauna are my favourite! Yes..! it’s totally off topic. but you shared a nice story of your life. Thank you so much for these great set of templates, is it easy to edit them like colors, columns, width etc.